Here at GigaOM, we’ve followed the tectonic shifts happening in book publishing pretty closely. From Laura Owen’s great daily analysis of all things e-books to Mathew’s thoughtful takes on how publishers are adapting, to the occasional analysis from yours truly, we consistently analyze what the changes, big and small, mean for the publishing industry. And yes, we also try to understand what it means for ourselves. As we’ve watched old publishers evolve and entirely new types of publishers rise up, we’ve never lost sight of the fact that we, too, are a digital publisher. Whether it’s the daily analysis of tech on the GigaOM Network or our deep dive analysis on GigaOM Pro, our fast-growing paid research business, we’ve discovered our own community of 5 million or so is made up of readers with a broad array of interests, all who consume information in a number of different ways. And increasingly, one of those ways is in digital book format. The fast rise of tablets and e-readers, the low-friction of buying content through vertically integrated experiences from the likes of Apple or Amazon, and the explosion in new voices that digital books have enabled, have all helped e-books ride up the hockey stick of growth to reach 25 percent adoption in the broader market, and is no doubt even higher among our own early adopter audience. So what does that mean for us? At GigaOM, it usually means we try new things. One thing I learned quickly when I came over to the company in 2009 to help launch a new model for market research, it was that Om and our CEO, Paul Walborsky, encourage their employees to experiment and embrace new ideas. So late last year, when Mathew, Nicole Solis and I suggested we should try our hand at e-books, they were all for it. 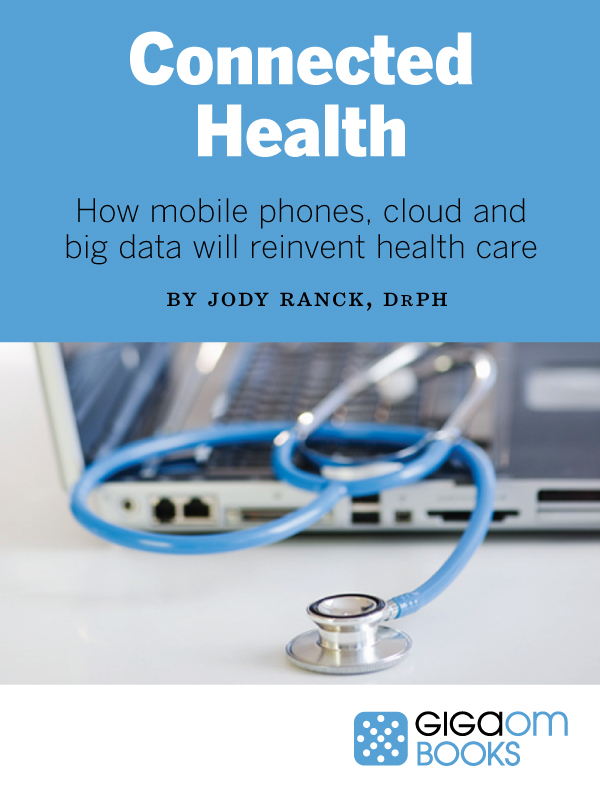 GigaOM Books first two titles, available today, include Cut the Cord: All You Need to Know to Drop Cable, by Janko Roettgers, and Connected Health: How Mobile Phones, Cloud and Big Data Will Reinvent Health Care, by Jody Ranck, DrPH. 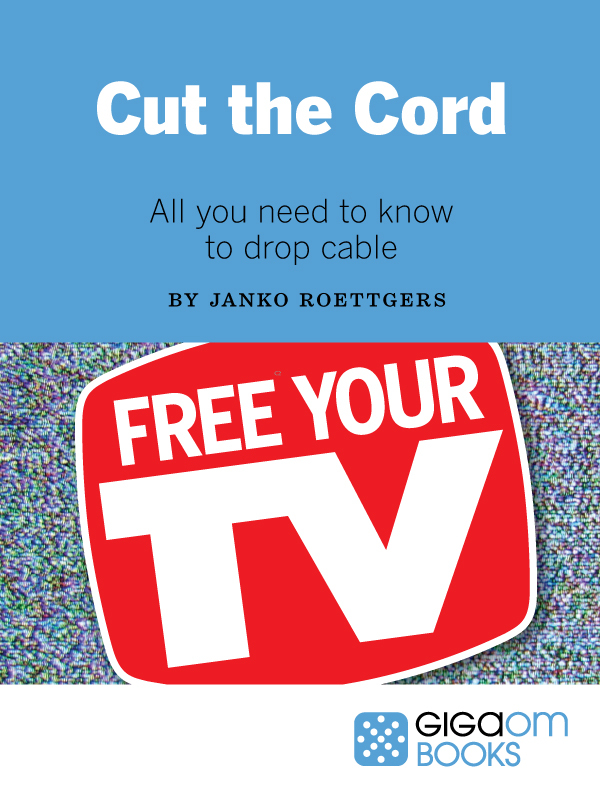 Cut the Cord: All You Need to Know to Drop Cable is a book from our own cord-cutting expert Janko Roettgers, host of our Cord Cutters video series. Many of you are familiar with Janko’s work. For the last five years, he’s covered all the latest devices that allow consumers to get over-the-top content to their TV, and he’s condensed much of what’s he’s learned in this informative, helpful guide for those looking to finally cut the cord. Anyone who interested in discovering how new technologies will impact — and possibly reinvent — health care should pick up the new book, Connected Health: How Mobile Phones, Cloud, and Big Data Will Reinvent Health Care by renowned digital health expert, Jody Ranck (with a foreword by connected health giant Frank Moss). Jody, who has spoken at many of GigaOM’s events on the changes technology is bringing to health care, shows how many of the things we write about everyday, from cloud computing and big data to iPhones and social networking, will help break through much of the stagnation and systemic bureaucracy slowing down the much needed change to a sick health care system and provide huge opportunities to entrepreneurs going forward. These books, the GigaOM Pro reports, and some of the books coming in the next few months (such as Jeff Roberts’ account of the Google Books settlement and crowdfunding expert Nathaniel Hansen’s must-have guide to Kickstarter campaigns), can all be found at our new GigaOM Books site, where you’ll be able to read a little bit about each title, the authors, and click on your choice of e-book platform and store to buy the book at. We know people like to buy e-books through the storefronts they know and love, so we’ve made it really easy to do just that. We’ll also be considering future books, so if you have a (really) good idea for a book, feel free to pitch us, and if we’re interested we’ll contact you to chat. As always with projects like this, there needs to be some shout-outs. I’d like to thank my partner in crime on the editorial side for GigaOM Books, Nicole Solis, for her late nights on this all, while planning a wedding and getting married; our always capable tech team led by Ian Kennedy for helping to build us a site; our marketing gurus Alison Murdock and Allison Parker for getting the word out. We also want to thank the good folks at Vook for their help and advice, and their super-easy to use SaaS platform for creating e-books, as well as e-book guru Erik Christopher of Uglydog Digital for last minute help and guidance. And of course, our fearless leaders, Paul and Om. Thanks everyone, and thanks to our readers (and future readers). Now check out GigaOM Books! I had asked for information and help from this site but nothing happened. Are you any use to anybody? Congrats, Michael! You certainly have some experience now. I am so excited about this and can’t wait to see what’s next. Living in Australia, I’d also love to see someone pick up the torch on how to cut the cord over here! Fewer over the top services and more rights restrictions means it’s still a way off, but it will be well worth it when it comes. Hey Kelly – not sure if you saw Janko’s quick video intro to Cut the Cord, but here it is. Hope you enjoy the book! Just purchased the Connected Health eBook. Looks great so far! I’m excited to see what other ebooks GigaOM produces. Thanks Dave! We’ve got some good ideas, so keep watching!